A few years ago I sat down with an executive coaching client (let's call her Jeanne) who was a new Director of HR. As we discussed her leadership goals and challenges, Jeanne told this story, "Last week my COO walked into my office and said, 'I've had it with George. I want him fired. Make it happen.'" Jeanne went on, "I wasn't comfortable with the demand, but because the COO is my primary customer, I went ahead and did what he wanted." As we discussed the situation a light bulb went off. Because Jeanne loved to ride I could use the metaphor of "riding as leading from the saddle" to help her achieve a deeper understanding of her leadership role. To become a great rider Jeanne would have to lead her horse to ever-increasing standards of performance. This means she first had to be able to envision the standard of performance she sought. Second, she had to understand her role in leading her horse toward it. I took her through an example. 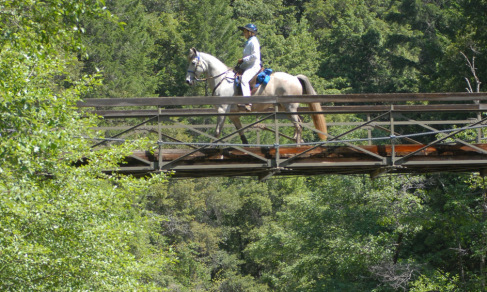 "Imagine," I said, "you're riding on a trail and you come to a wooden bridge over a small stream. Instead of walking calmly over the bridge, your horse skitters over it. What would you do?" "I'd keep on riding," Jeanne replied. "Because the stream scared my horse and I would want to go on to calm it down and probably because I'd have my mind on where I was going." "Well, what would that teach the horse?" I asked. After a pause, she answered, "That it's okay to skitter across a bridge." Clearly, that's not a lesson Jeanne wanted her horse to learn. What could she do instead? In order to correct that behavior, she would first have to envision the performance goal: my horse will walk calmly across a bridge over running water. Second, she'd have to really believe that the goal is attainable -- and good for both her and the horse. Third, she must know in-the-moment exactly what she would have to do from the saddle to lead her horse toward that attainable standard of performance. So, what does this have to do with Jeanne's situation? Jeanne actually skittered past a scary situation with the COO. Yes, she had the professional wisdom to be uncomfortable with the COO's request, but she wasn't sure how, as a leader, she should handle it. Why? Because she didn't have a clear vision of what it meant for her to execute her leadership role. She didn't believe that it was possible for her to push back, instead of complying. And she was not able to harness her discomfort and appropriately act in-the-moment. As a leader it was Jeanne's job to bring balance to the COO's request by highlighting the risks of the precipitous act of firing George (who had no documented performance issues and hadn't committed any violation of company policy.). The COO may have prevailed in the end, but her professional leadership responsibility was to discuss the down-side risks. I realized that if I could help Jeanne understand the parallels between leadership at work and leading from the saddle, she would become both a great leader and a great rider. She and I worked together to revisit the situation with the COO, to redefine her leadership role and to enact an appropriate range of responses. We put to good use leadership lessons "straight from the horse's mouth."